The nice girl which is leaning on this old car is Maruska, my travel mate from Czech Republic who was doing some kind of exchange in Bulgaria too. The car is an old Zastava, from a Serbian car factory. 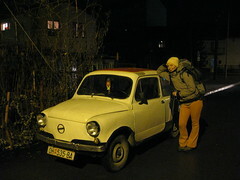 The picture depicts either a Zastava 750 or 850, which were produced between 1955 and 1985 and are still very popular in the former Yugoslav countries. 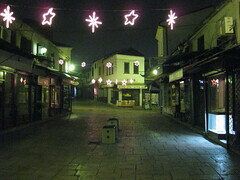 This particular picture was taken in Ohrid (OH), in the south-west of Macedonia (FYROM) on January 2nd, 2009. Macedonia (FYROM) has a large Turkish (Muslim) minority, a result of 500 years occupation by the Ottoman Empire. This is picture from the big Turkish bazaar, sleeping at night, but busy during daytime. It was the evening of January 1st, maybe it was even calmer than on normal nights. 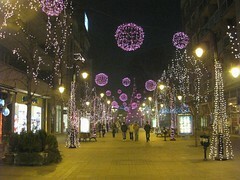 It’s not the time of year right now, but this were the Christmas lights in Skopje, the capital of Macedonia (to be exact: FYROM, Former Yugoslav Republic of Macedonia). The Macedonian orthodox church celebrates Christmas, like many of the orthodox churches, on Januar 6th. Therefore everything was still in full anticipation, when we went there on the evening of January 1st, with the first bus from Sofia. 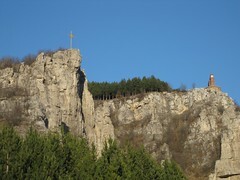 A last picture from that rock face in Gara Lakatnik, from my first visit in January 2009. This time we can see the summit cross on of the protruding rocks and the memorial, the main attraction of that site. The memorial remembers the ‚Bulgarian coup d’état of September 1944‘, when the Bulgarian kingdom was overthrown with the help of the help of the Red Army, which finally led to Bulgaria joining the soviet block. Again Gara Lakatnik – I hope it doesn’t get boring yet – this time in the beginning of May, and spring has finally started. I went there again with to Polish friends who were on the Erasmus program too. They really loved the place, and the view is really beautiful from there – this time to the East. It’s part of the main line between Sofia and Varna, and it’s the slowest part, as it’s going through the mountains and is very curvy. 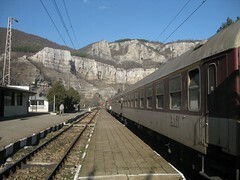 The next bigger towns along the train line are Svoge to the South and Mesdra to the East. 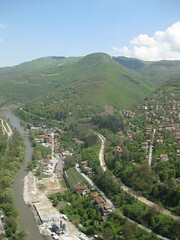 In the area next to the river you can see some small industrial landuse, between the train line and the right picture corner the spreading village of Gara Lakatnik. I really liked this rock face near Gara Lakatnik so, one day when I needed some fresh air, I went there again (and a third time in June with some other Erasmus students). Down in the village a nice Bulgarian couple started talking to me, I think they thought I’m confused and lost my way, in fact I was just doing some mapping for the OpenStreetMap-project. Anyway I showed them the way up the rock face, as they were there for their first time and we had a really nice time together. As you can see, although it was the beginning of April, spring hasn’t really started yet, only the cherry trees were in full blossom. In the valley you can see the train line in direction Sofia. There was an especially warm period in Bulgaria nearly one year ago. I and two friends used the opportunity to go for a little hiking trip to Gara Lakatnik, about one hour by train to the North of Sofia. That rock face in the background is easily climbable in about an hour, a socialist monument waiting on the top. Gara Lakatnik is a village itself, it must have been founded when the train line was built. There’s a village Lakatnik too, some kilometers to the East. 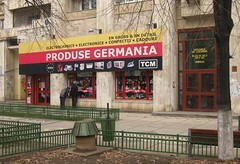 Today I want to show you a picture of a „TCM“-shop selling „Produce Germania“ meaning „German Products“. Quite funny, you can find them all throughout Eastern Europe and seem to be quite popular, selling electronics, cooking utensils and clothing. In Germany and Austria those products are sold by coffee shops like Eduscho and Tchibo and are famous to be „low priced“. My mother is very fond of them, she often buys me some stuff. 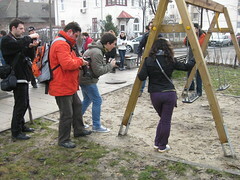 The day I went to Bucharest (Rumania) my CouchSurfer joined a group of photographers who meet regularly (like once a month) to explore a district of their city. For sure I used the opportunity to join them, that’s what I’m travelling for, don’t I? It was really interesting, as this were my first experiences with Rumanian culture. If I remember correctly, on this picture I think they were taking pictures of the moving swing. In March 2009 I made a trip to Kosovo, as I was interested in the youngest democracy of Europe. It’s a country which still needs a lot of time and energy to develop their economy, but people are very friendly and helpful. 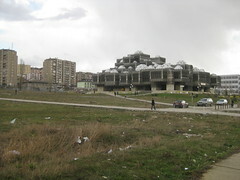 In this picture you can see one of the most famous buildings of Prishtina, the capital: The national library, located near the city centre in something which might develop into a park some day.